Scandinavian chic: The Art Nouveau revolution came after the fire of 1904 destroyed the solid wood buildings. When I studied geography at a high school in Mumbai, even the thought of the Arctic Circle was enough to make me shiver. My mother would make me wear a sweater when I went to see a film at Sterling—it was a new cinema hall and under Tata management, and she felt its air conditioning would function properly, and be strong. But I like cold weather, and two years in New England —where the sun set at three in the afternoon in the winters and snow was my constant companion for nearly six months of the year—had made me actually like colder climates. And yet, the phrase “Arctic Circle" made me shiver again several decades later, when a seminar had brought me to Oslo and some friends suggested a trip to a fishing town called Ålesund, the closest I have been to the polar regions, on a free weekend. Ålesund was known for kleppfisk, or dried salt cod, I was told. And it had majestic fjords. It was late spring and much of the snow had started to melt or disappear, and it also meant plenty of sunshine and mild winds with occasional showers. I had been to Scandinavian towns before, but I was utterly unprepared for Ålesund (about 170 miles, or 274km, up the coast from Bergen; the largest town before you reach Trondheim), for it is unlike any other town in the region. 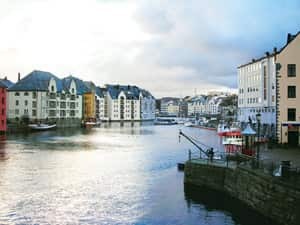 But Ålesund was different: It was a town frozen in time—a time when Art Nouveau architecture prevailed—in the middle of the Scandinavian coast. Late in the night of 23 January 1904, a fire spread rapidly through the centre of the town, destroying nearly 800 homes and everything else that stood in its way. Remarkably, only one life was lost, that of an old woman who returned to her burning home to pick up her purse. The town burnt easily because it was made of solid Norwegian wood. Ålesund is remote now—after a two-hour flight from Oslo, the city lies beyond bridges connecting the islands that make up the archipelago, with mountains dotting the landscape—and it was far less accessible a century ago. What followed was extraordinary, as Denmark, Sweden, France and Germany chipped in, assisting a town of practical people who decided to rebuild the city centre with minimal fuss but maximum grace while giving the town a distinct character. Wood was out, stone was in. At that time, Art Nouveau, or Jugendstil as Germans called it, was the fashion of the day. It meant bold, stark statements, with extravagant colours and design, elaborate ornamentation on the corners of buildings and an exuberant, celebratory feeling. Art Nouveau buildings have slender curves and rhythmic flows to their lines; and Norway let its hair down, losing some of its seriousness, succumbing to the seductive charms of design. And so, on a coast where every town looks like the identical twin of the whaling towns to its left and right, Ålesund stands apart. It does not make it look out of place or grotesque. Even though certain buildings looked as though they were lifted from a Parisian boulevard or a German street, they seemed appropriate, in a curiously fairy tale way. Many of the old warehouses and shops have been converted into hotels and restaurants, but the designers have paid attention to detail, and stayed true to the town’s unique spirit. Windows are still narrow; roofs remain steep. The walls outside are not garish, and subdued colours dominate, in line with Scandinavian austerity. Some ambitious turrets rival spires, and there are gables and gargoyles, as there are twists and turns spinning and swirling around what would have been Scandinavian straight lines. As I walked through the city, its beauty revealed itself in unusual ways, through artistic pumps, the gorgeous views of the waterfront from between buildings, and later, as I was to discover, the pristine sights of fjords once you went away from the town. It was too windy to kayak, so we took a ferry towards Geirangerfjord, a heart-stoppingly uplifting jet of water that slices through land, dwarfed by snow-capped mountains that routinely gush forth, becoming glaciers over time. We sailed gently towards the fjord, with the towns becoming smaller, and neat orchards around each home. As we turned, with the sky darkening, the lights came up in those homes, and it looked as if we were surrounded by stars on the hills, guiding us back to Ålesund, the air rich with the smell of freshly cut grass in the fields. At first light, Ålesund looked like a painting. In its absence of flamboyance lies the unexpectedness of a freeze-frame, of what Art Nouveau would have been if it had remained frozen in time.